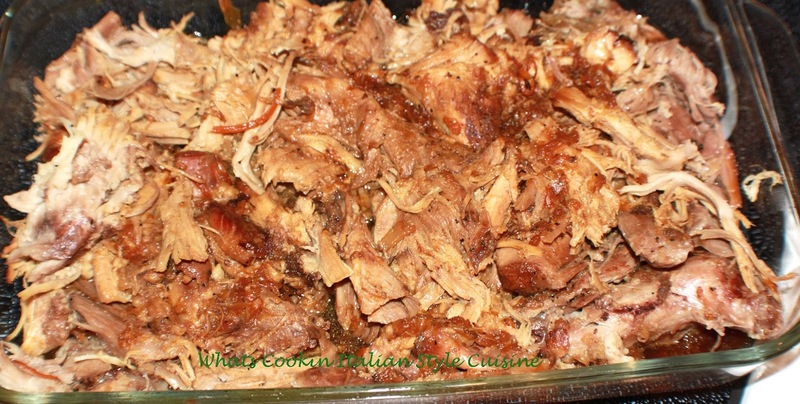 This is the best slow cooked pork I have ever made. There is a secret ingredient in this recipe. Heat oven to 350 degrees or use a slow cooker for 8 to 10 hours. Place the cabbage on the bottom of the (pan, baking bag or slow cooker works great too) and then place the roast on top of cabbage in the cooking bag or roasting pan. Add the bourbon, garlic, salt, pepper, oregano, apple juice, soy sauce, olive oil, the spread applesauce on top of pork. Place in preheated oven ( slow cooker 8 to 10 hours on low) or slow cook for around 4 to 5 hours at 350 degrees in the oven covered with foil. If roast looks like its getting dry add more apple juice. Serve with roasted garlic potatoes and baked beans.